A-HOTEL.com - Luxury and cheap accommodation in Goryachevodskiy, Russia. 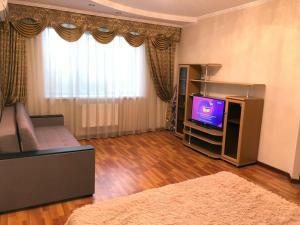 Prices and hotel, apartment booking in Goryachevodskiy and surrounding. Hotel Motel is located at the entrance of Pyatigorsk, a 5-minute walk from central Kalinina Prospekt. Rooms here will provide you with a flat-screen TV, air conditioning and wardrobe. Guesthouse on Georgievskaya provides rooms in Pyatigorsk. All rooms feature a kitchen and a private bathroom. Located in Pyatigorsk, Gostievoi dom na Yablonevaya provides barbecue facilities and free WiFi. Guests can make use of a garden. With mountain views, Apartaments na Uglovom is situated in Pyatigorsk and has free WiFi. All units come with a seating area, a flat-screen TV and a fully equipped kitchen with a dining area. Located in Pyatigorsk, Guest House Leon features a terrace. All rooms boast a flat-screen TV with cable channels and a private bathroom. Holiday Home near Tsvetnik is set in Pyatigorsk. It features free WiFi and a garden. Offering accommodation with air conditioning, Apartment u Tsvetnika is set in Pyatigorsk, 32 km from Kislovodsk. Essentuki is 18 km away. Caucasian cuisine, a sauna and an indoor pool are offered at this hotel in Pyatigorsk. It lies at the foot of Mashuk Mountain, just 500 metres from the M29 motorway. Apartments on Teplosernaya is situated in Pyatigorsk. Guests may enjoy free WiFi. Offering free WiFi and river views, Apartment is an accommodation set in Pyatigorsk. Guests staying at this apartment have access to a fully equipped kitchen. Offering self-catering accommodation with free WiFi access, Kompliment ApartHotel is located in Pyatigorsk, a 10-minute walk from the Academy Gallery and Tsvetnik City Park. The elegant studios and apartments are air conditioned and have a flat-screen TV. Квартира на Партизанской 3 is set in Pyatigorsk. The air-conditioned accommodation is 42 km from Kislovodsk. Apartment Na Teplosernoy provides rooms in Pyatigorsk. All rooms feature a flat-screen TV with satellite channels and a private bathroom. Featuring a restaurant and café overlooking the river, Hotel River is conveniently located in Pyatigorsk. Free WiFi access is available. Featuring free WiFi, Tourist Guest House offers accommodation in Pyatigorsk, 30 km from Kislovodsk. Free private parking is available on site. Apartment Na Vodakh is located in Pyatigorsk. The property features mountain views and is 43 km from Kislovodsk. Apartment in the Park Tsvetnik is located in Pyatigorsk. Free WiFi is offered. Guest House Uyut is located in Pyatigorsk. The accommodation provides free WiFi. Apartment on Dzerzhinskogo is set in Pyatigorsk. This property offers access to free WiFi.